The second day of our trip allowed me to explore Frankfurt by myself as Mrs. G was stuck working the trade show. 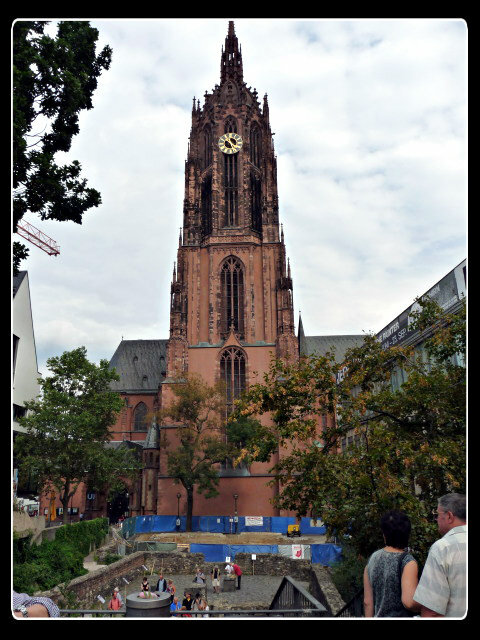 I started off by taking the train to the Hauptwache Station near Romerberg Plaza because I wanted to check out some of the churches and the river that I had glimpsed the day before. With no agenda and no rush, I took my time, checking out the shops and admiring the architecture. Of course wandering around works up an appetite and a thirst. I spotted a place that looked like I could find a little snack to tide me over called Hans Wurzt. 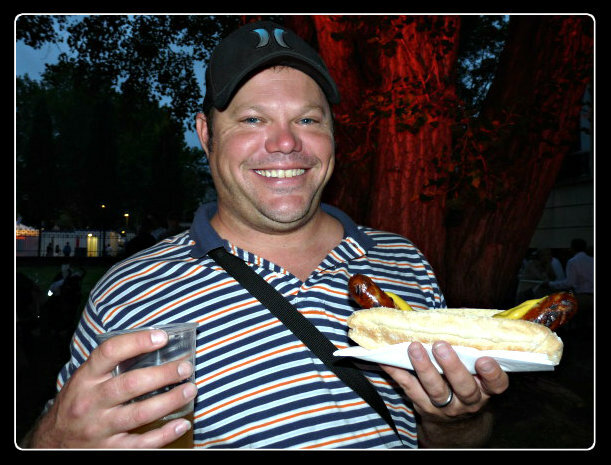 Having already sampled some of the local bratwurst, I decided to be a bit daring and order something of which I had no clue….the Original Bayrische Weisswurste and Brezel, which is a Bavarian white sausage made from finely minced veal and pork bacon. It is usually flavored with parsley, lemon, mace, onions, ginger and cardamom that is stuffed into pork casings. It usually measures 10 to 12 cm long and 2 cm thick. There is a saying that the sausages should not be allowed to hear the church bell’s noon chime as there are no preservatives, they are not smoked and they are highly perishable. They should be consumed before then. These sausages are heated in water, broth or white wine just short of boiling for about ten minutes. And one word of warning….the casings are not edible!! So make sure to remove the casings before eating. It was definitely an interesting sausage, plenty of flavor from the herbs and lemon. Something I’m going to try and duplicate if I can find a recipe. After finishing my snack and a bit of people watching, I made my way down to the Main River. 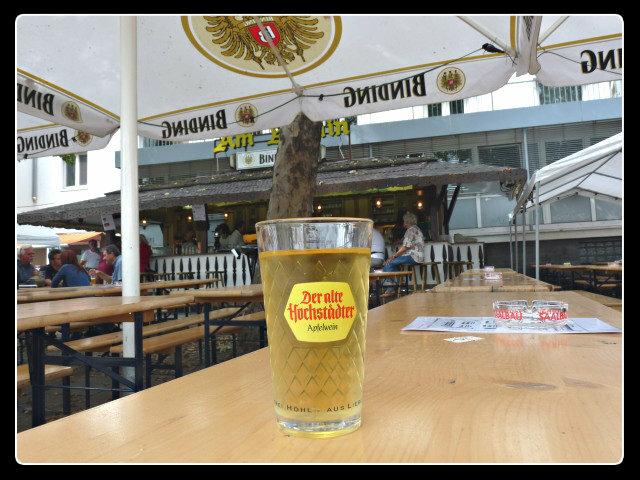 Across from the Eiserner Steg, there is a little bier garten. It seemed like the perfect place to stop and try my first apfelwein. I would love to tell you the name, but I’m not sure what it is. At first, I thought it was Der alter Hochstradter, but later on I learned that was the name of the company that makes apfelwein. I also wrote down the name Getronkekarte, but I have no idea why anymore. I think it was on top of the menu, but it could have meant anything for all I know. Regardless, I ordered my apfelwein. Story goes that one year, Frankfurt had a bad grape crop. So they decided to make wine out of apples. They liked it so much, they’ve been making it ever since. Apfelwein (aka Ebbelwoi) is an alcoholic cider that can be drank straight or mixed with water, sparkling water or lemonade. There is also a sweet version which we later discovered. I can’t tell you exactly how I ordered this one. My German is pretty much non existent as was the English of my waitress. The apfelwien had an obvios taste of apple, a bit tart and sour and a little watery, which leads me to believe I got the watered down version. It tasted like a mix between a white wine and a hard cider (like Woodchuck I ‘spose, but I don’t drink that stuff) just not carbonated. Takes some getting used to, but it is refreshing and a nice change of pace from all the German beers I had so far. 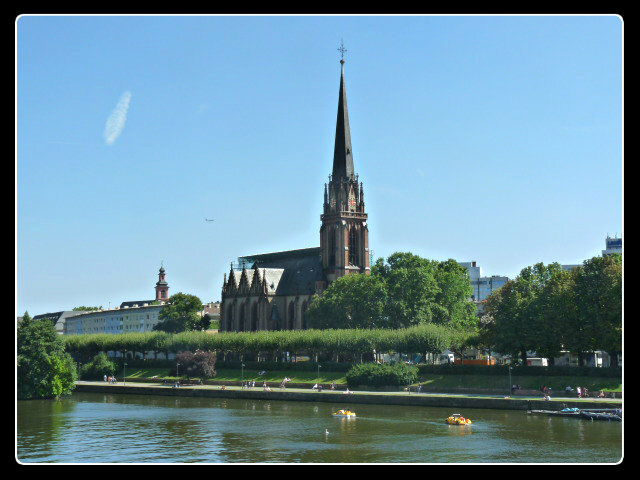 After finishing my apfelwein, I decided to cross the Main River to explore the Epiphany Church. 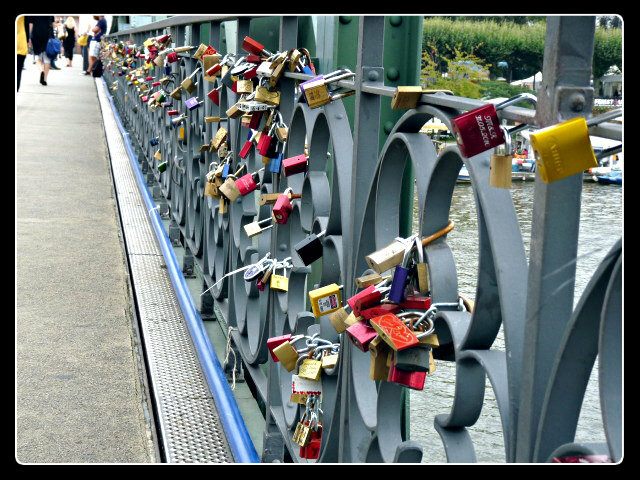 While crossing the bridge (or steg), I noticed it was covered with locks. New locks, old locks, plain locks and colored locks, locks of all shapes and sizes. I later learned that it is good luck to have your name and your partners name engraved on the lock and attached to the steg. Unfortunately, I was not able to learn the story behind it. All I could learn from some bartenders and waitresses between mocking laughs was the bit about the luck and that they all thought it was “gay” and “stupid”. Typical bar staff behavior, I thought it was kinda romantic. Look Ma….I did something besides eat and drink. I actually went and saw a landmark….all on my own. The Epiphany Church was not what I was expecting. I guess I was expecting an old, Gothic style church. This church just seemed old and rundown. I did walk around and checked it out and donated a few Euros to the ongoing restoration, however. 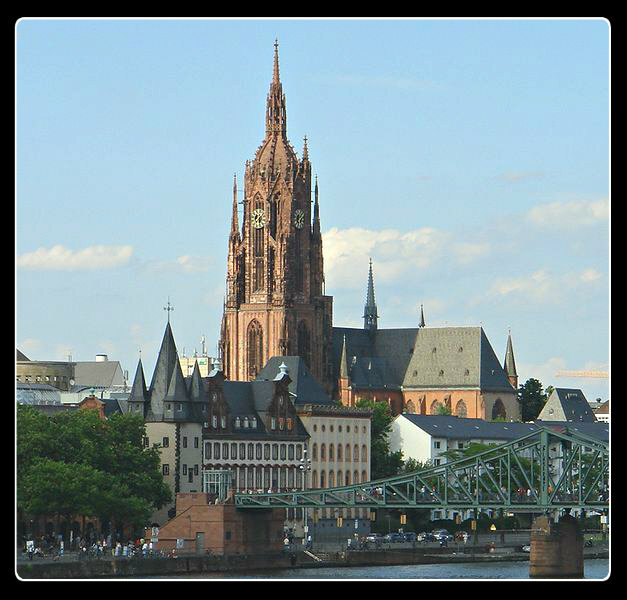 After touring the Epiphany Church, I decide to head back across the Main River to check out the Frankfurt Cathedral, also known as Saint Barholomew’s. This is a view of it across the river, with the Eiserner Steg in the foreground. (if you are really interested in that bier garten, it’s across the street (on the right) from the base of the steg). 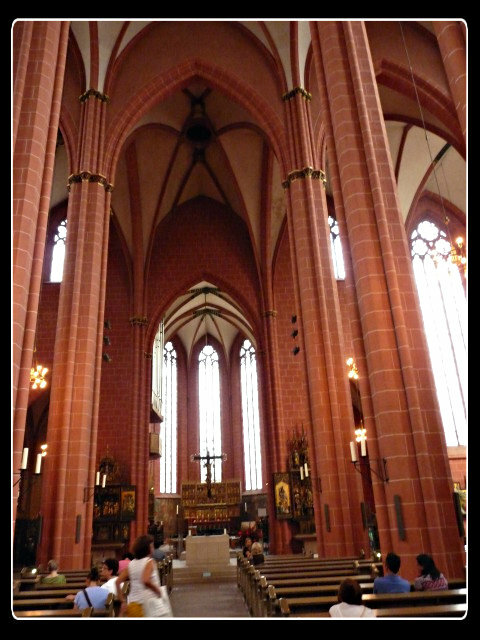 The Frankfurt Cathedral was built in the 13th and 14th centuries. It sustained severe damage during WWII and the inside was completely burned out. It was later restored in the 1950’s. At the front of the cathedral, you can see where some excavation is taking place. They are in the process of unearthing and restoring an old Roman bath house that was built prior to the church. This was more what I was expecting to see in an old European Church. 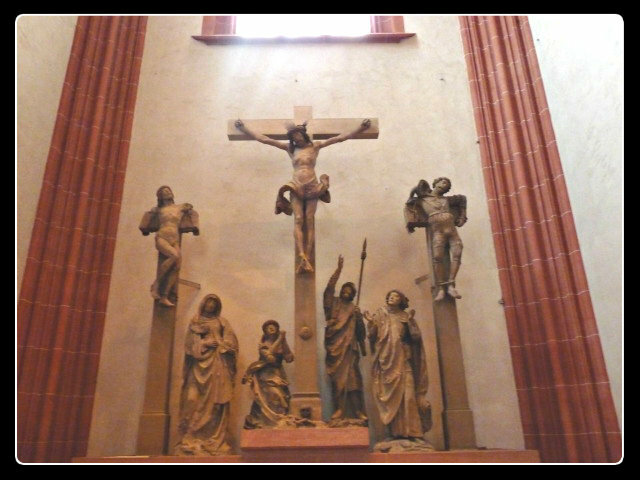 A statue in the back of the church depicting the crucifixion of Jesus. I wish I could give you some reference to how big this was. All I can say is that I was shooting this over the heads of some tourists who wouldn’t get out of the way. The figures in the statue were easily larger than life-size. 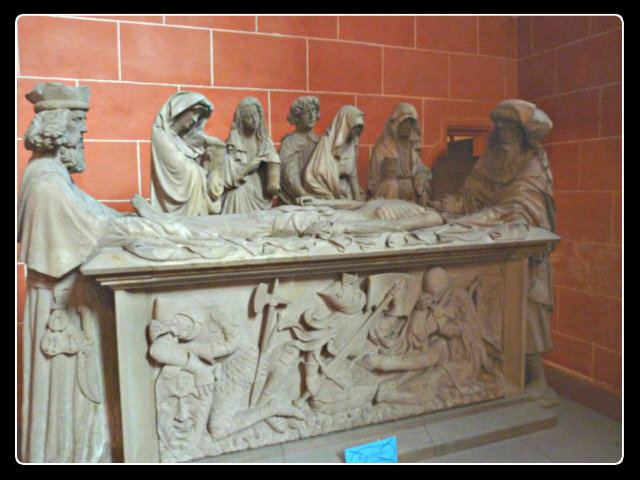 Another statue in the cathedral. I think this is a tomb, but I couldn’t figure out if anybody was buried in it or if it was just a statue. Some places in Frankfurt were really great on having English translations. This was not one of them and there was nobody around to ask. 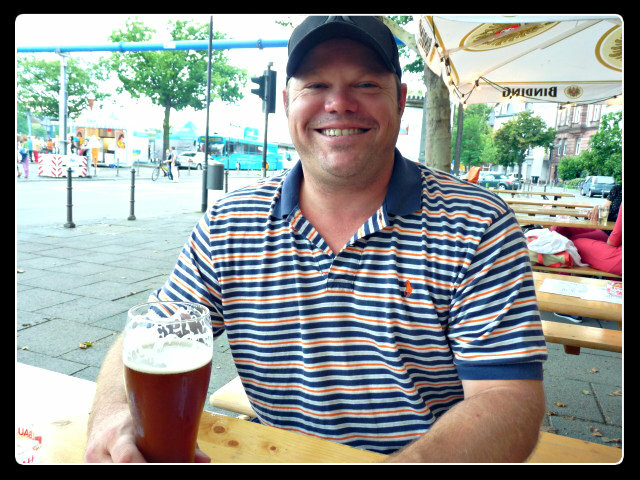 Back at the bier garten that I don’t know the name of…. After the Frankfurt Cathedral, it was about time for Mrs. G to finally get off work and meet me, so I headed back to the bier garten. Maybe someday I’ll learn the name of it. This is my goofy looking mug enjoying a Shofferhoffer Dunkel Weizen. Pretty tasty beer. After having a beer with Mrs. G, we went to explore the Museum Superfest, a yearly festival that spans both sides of the river for over a mile long. 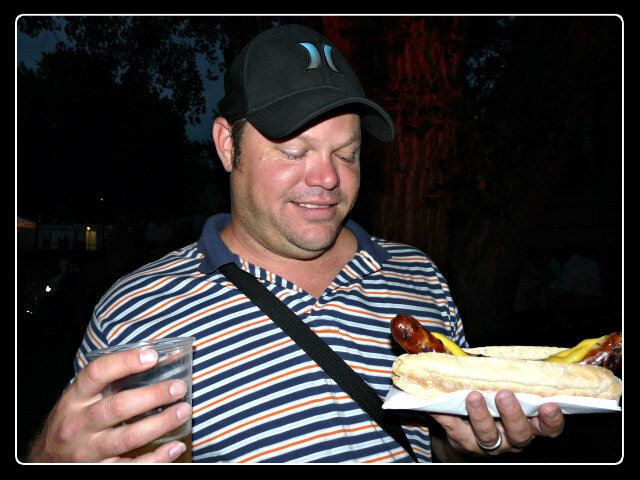 German Bratwusrt on a bun. Can I eat that? I’ll get into the sites at the Museum Superfest more in my next blog, but for now…Auf Wiedersehen! Previous: Previous post: Chicken with Grilled Corn Salsa and a Birthday!! Enjoying your photos. So I have heard that Stella is like bud light over there? Is that true? If so, I may have to rethink my beer choice !!!! Enjoy your holiday! I’m not sure. To tell the truth, I’m not sure I even saw Stella the whole time I was there. Doesn’t Stella own Bud now? Or is it Miller? The cathedral is simply a stunning achievement, just seeing the pictures makes you proud to be a part of the human species. 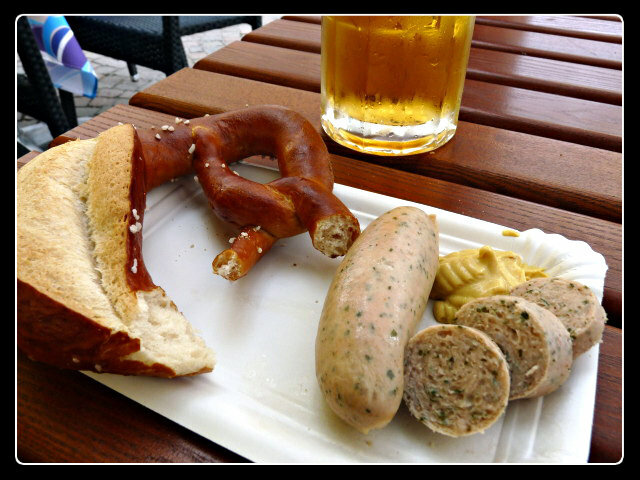 That Weisswurste is wild, it looks so light and airy, was the texture like regular sausage or lighter? It was a very light and had a very fine grind to it. Plenty of flavor from teh herbs, just glad they spotted me as a stupid tourist who didn’t know better and told me that the casing was not edible and to make sure to cut it off. 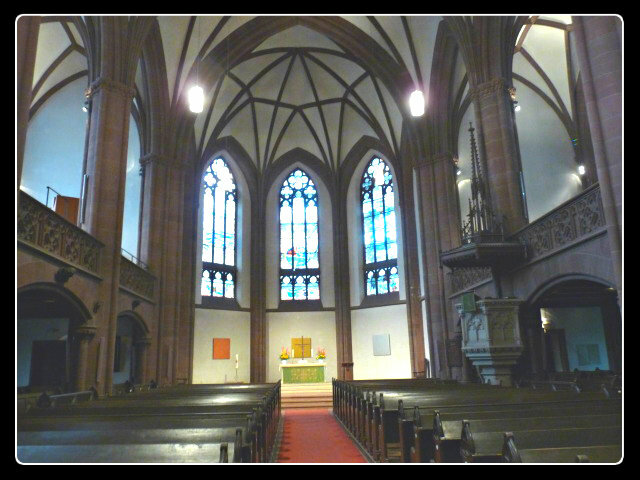 Wish i would have had more time to explore the churches and the old buildings. They were very impressive, especailly that cathedral.